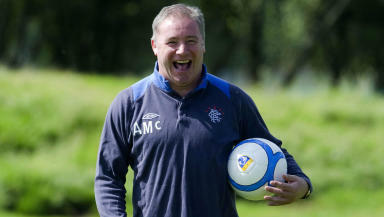 The pair linked up with Ally McCoist's side at Murray Park on Monday morning. Brazilian midfielder Andre Moritz has started a trial period with Rangers, STV understands. The 26-year-old, who holds Italian citizenship, is available on a free transfer having left Turkish club Mersin Idmanyurdu in the summer. Moritz has spent the last five years in Turkey, having moved to Kasimpasa S.K. from Fluminese in 2007, before going to spend a season apiece with Kayserispor and Mersin. A left-sided attacking player, Moritz arrived in Scotland at the weekend and joined Ally McCoist's side for training at Murray Park on Monday. Rangers have already added his compatriot Emilson Cribari to their squad, as reinforcements are added ahead of the commencement of a one-year signing embargo starting September 1. Moritz was joined by French defender Sebastien Faure, who is also available on a free transfer having been released by Olympique Lyonnais. The 21-year-old, a France Under-20 international, also played at FC Nantes on loan last term and spent time on trial at Leeds United earlier this summer.